I love that we get to try out some of the coolest new things that come on the market! 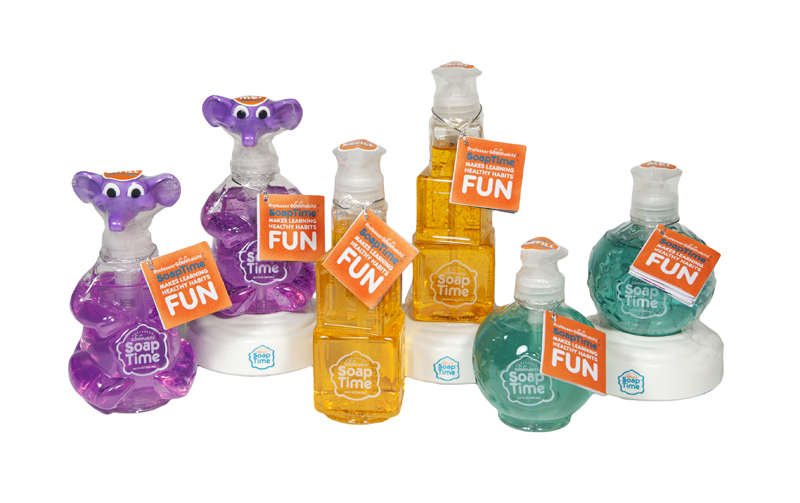 SoapTime® is a soap system that entertains kids and helps them wash their hands long enough to scrub away germs. Different shaped soaps fit on the base, and when you press the dispenser, the base lights up and sings a song or shares a fun fact. It's active for about 20 seconds, which is how long we're encouraged to wash our hands to get rid of germs. Each soap bottle has a different theme with different songs and facts. This system has been in our bathroom for a week or so now, and every once in a while I still hear a giggle when the kids wash their hands. I also like it because it's a lot harder for them to just swish their hands under the running water for a second. Lydia was happy to do a video review, so here it is! Mandatory Question: How do you encourage regular hand washing? Good Luck! I will choose a winner on October 3, 2011. Lydia wants me to tell you all that she forgot to say that the soap also smells really good! You can learn more about the system at their website. You can find the system at Bed, Bath & Beyond right now, and it should be available at more stores soon. Lydia has the best reviews! Nice job.